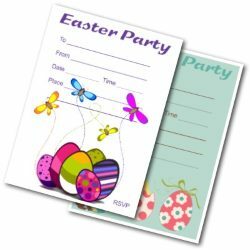 Having a kids Easter egg hunt Party? 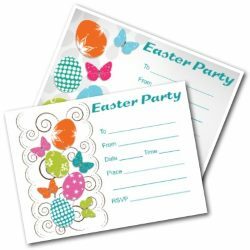 These printable Easter party invitations will be just the thing. Kids just love hunting eggs - and parties in general! So why not combine the two. 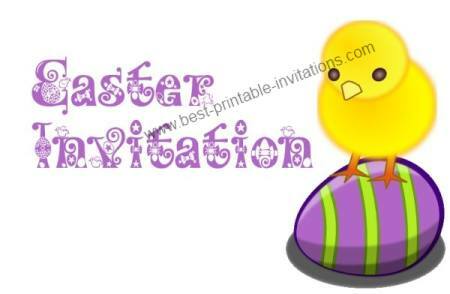 And these free printable invites will make inviting your guests a piece of ....chocolate egg! Two great designs both featuring chocolate eggs. Very cute chick on an egg. A fun way to invite guests to your party! This invitation prints onto a single page and then folds to make a card. Lots of space inside to write out the event details. Simple but classic design of a pile of colored eggs in a basket. This is quite striking when printed up. It prints onto a single page then folds into a card. Don't use paper that is too thick, or it will make it difficult to fold. 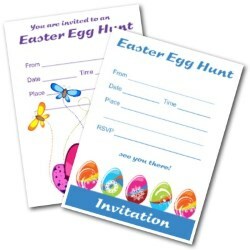 No Easter party would be complete without an egg hunt - however old your guests! No-one is ever to old for this fun game! 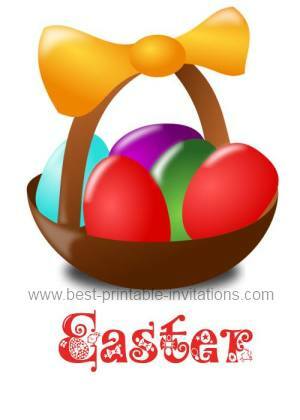 If you are looking for more activities, how about these easter crafts for kids? Eggs have played a big part at this time of year for centuries. The egg has been a symbol of birth around the world for centuries. Exchanging eggs in the springtime is a custom that goes back many centuries. They were often wrapped in gold leaf (if you could afford it!) or colored brightly by dying them with leaves and petals. When I was a child we would take our dyed eggs and roll them down a nearby hill. The winner was the one who could get their egg to the bottom intact! It is a good idea to take spares - everyone is gong to want a second try. You can find out more about Easter egg traditions at Wikipedia - and check out this bizarre tradition reported by the BBC. I hope you have a wonderful party!